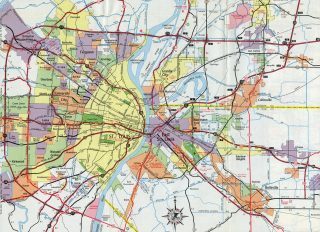 Interstates 270 and 255 comprise the outer belt freeway system of the St. Louis metropolitan area. Interstate 270 begins at the exchange with Interstates 55 and 255 south of St. Louis near Mehlville. 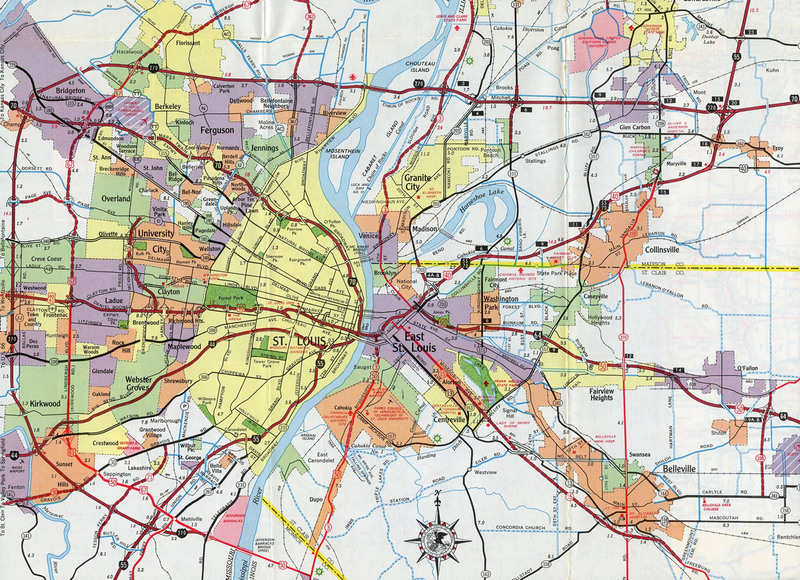 Northward from there, the freeway loops through Sunset Hills, Kirkwood and Creve Coeur among other St. Louis County suburbs to Interstate 70 at Bridgeton. The east-west portion of I-270 extends from Bridgeton through Hazelwood, Florissant and Bellefontaine Neighbors to the Chain of Rocks Bridge over the Mississippi River. Crossing into Madison County, Illinois, I-270 navigates along a causeway on Chouteau Island to Chain of Rocks Canal and northern reaches of Granite City. The rural style freeway continues east to Pontoon Beach and Glen Carbon, merging with I-70 at its split with I-55 near Troy. Mile posts along Interstate 270 increase from zero at I-55 and I-255 in south St. Louis County to 34 at the Mississippi River. Illinois restarts the count at zero at the Missouri state line and continues to 15 at I-55/70. Despite Interstate 70 meeting the east end of I-270 at around milepost 19, the numbering sequence from I-270 extends east along I-70. Interstate 144 for the Southwest Beltway, from I-55 north to I-70. Interstate 255 for the Easterly route to the Illinois state line at the Mississippi River. Interstate 270 for the North Beltway from I-70 east to the Chain of Rocks Bridge. 1977 Illinois Official Highway Map showing the small portion of I-255 opened at the time designated as part of an extended Interstate 270. The same actions approved by AASHTO on June 25, 1974 to renumber I-244 included the renumbering of I-255 to I-270 as well. The southeast loop changed back to Interstate 255 in 1979. AASHTO approved the redesignation, subject to FHWA concurrence, on June 25 of that year. Eastbound I-270 at IL 159 to Edwardsville. The freeway proceeds 2.5 miles to Exit 15 with I-55/70 south and I-55 north. Photo taken 05/24/18. Spanning Old Troy Road, one mile ahead of Exit 15A for I-55 south & 70 west to Troy and Collinsville. Photo taken 05/24/18. I-70 is omitted from signs for Exit 15A along Interstate 270 east to offset potential confusion for travelers headed east along the freeway to Indianapolis. Photo taken 05/03/12. A three-quarter cloverleaf joins I-270 with I-55 as Interstate 70 passes to the southeast between a pair of wye interchanges. Photo taken 05/24/18. Interstate 55 continues north from I-70/270 along a rural freeway to Springfield. Photo taken 05/03/12. Exit 15B loops onto I-55 north from the ending I-270 east. Interstate 55 concludes in 275 miles at U.S. 41 (Lake Shore Drive) in Chicago. Photo taken 05/03/12. Interstate 55 heads south from eastern reaches of Edwardsville to meet both Interstates 70 east and 270 west at Exit 20. Photo taken 06/01/11. One mile ahead of the three-quarter cloverleaf interchange (Exits 20B/A) with I-270 west to the Chain of Rocks Bridge and I-70 east to Effingham. Photo taken 05/06/18. Long distance travelers headed to Kansas City are advised to take Interstate 270 west across the north side of the St. Louis suburbs in lieu of I-70 west. I-70 angles southwest with I-55 to East St. Louis and across the Stan Musial Veterans Memorial Bridge into St. Louis. Photo taken 06/01/11. Exit 20B leaves I-55 south for I-270 west to Granite City, north St. Louis and Florissant, Missouri. 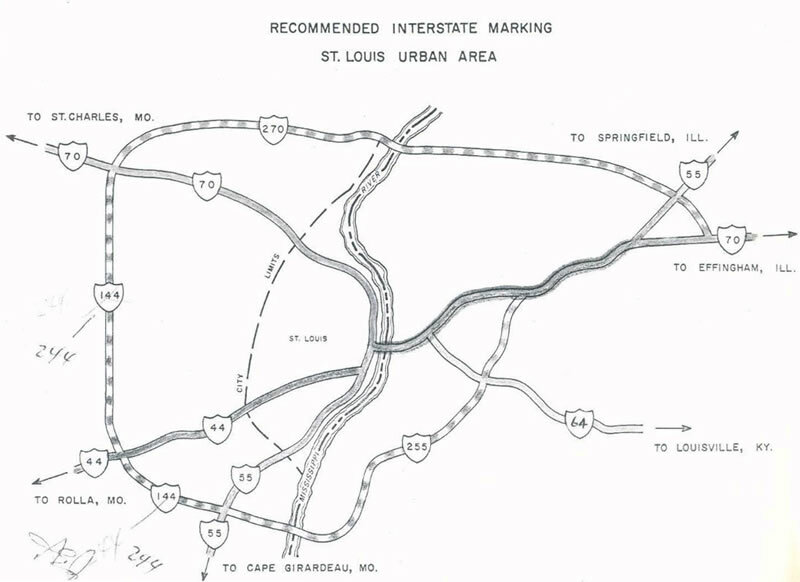 Interstate 55 advances south to combine with I-70 west for a 15.5-mile overlap to East St. Louis. Photo taken 05/06/18. Two miles north of I-70 and I-270 west on I-55 south at the Goshen Road overpass. Photo taken by Brian Dowd (06/02). All guide signs for the upcoming exchange with Interstates 70/270 were replaced to use Clearview font. Photo taken by Brian Dowd (06/02). I-55 south at I-270 west. I-55 merges with I-70 west just ahead of IL 162 to Troy. Photo taken by Brian Dowd (06/02). Interstate 55 northbound parts ways with Interstate 70 eastbound at Exit 20A. Exit 20B loops away from I-55 north to I-270 a short distance to the north. Photo taken 05/07/18. Interstate 270 leads west from I-55 near Troy 15 miles to the Chain of Rocks Bridge to northern St. Louis. Photo taken 05/24/18. Westbound Interstate 70 two miles from Interstates 55 and 270 west. Photo taken 10/16/04. One mile ahead of the I-70 westbound split with Interstate 270. The wye interchange is unnumbered, with Exit 15B designated for the adjacent ramp to Interstate 55 north. Photo taken 10/16/04. Interstates 55 south & 70 combine to I-64 in East St. Louis. I-270 bee lines west to I-70 at Bridgeton, Missouri. Photo taken by Jeff Morrison (08/13/05). Westbound Interstate 70 splits to the left as the mainline transitions to Interstate 270. Exit 15B follows for Interstate 55 north to Springfield, Lincoln and Bloomington-Normal. Photo taken by Jeff Morrison (08/13/05). Interstate 270 commences a rural drive 15 miles to the Missouri state line on the Chain of Rocks Bridge as I-70 angles southwest with I-55 to Troy, Collinsville and East St. Louis. Photo taken by Jeff Morrison (08/13/05). Two miles to the northwest of Interstates 55 (Exit 1A) and 255 on I-270 south at Sappington. Photo taken 12/20/09. Two lanes drop from Interstate 270 east for the collector distributor roadway to I-55 south to Memphis, Tennessee, I-55 north to St. Louis and U.S. 61 & 67 (Lemay Ferry Road) at Forder Road. Photo taken 12/20/09. An MODOT style end sign references the forthcoming transition of the St. Louis beltway from I-270 to Interstate 255 east. Photo taken 12/20/09. Theiss Road spans Interstate 270 a quarter mile from the partition with the three-lane c/d roadway for Interstate 55 south to Festus and Cape Girardeau and north to Lemay and Downtown St. Louis. Photo taken 12/20/09. Exit 1A leaves the ending Interstate 270 through the cloverstack interchange with I-55. U.S. 61 & 67 parallel I-55 south along an arterial route to west Oakland and the city of Arnold. The two highways combine with U.S. 50 along Lindbergh Boulevard by adjacent South County Center mall to the north. Photo taken 12/20/09. Replaced button copy guide signs at the loop ramp for Interstate 55 north. Now unnumbered, this ramp was formerly Exit 1B. Photo taken by Brian Dowd (06/02). Interstate 255 splits with U.S. 50 (Lindbergh Boulevard) and passes below U.S. 61 (Lemay Ferry Road) on the half mile approach to Interstate 55 and the transition to I-270 north Photo taken by Brian Dowd (06/02). One half mile east of Exit 1B for Interstate 55 north to Afton, Lemay and the Patch neighborhood of south St. Louis. Interstate 55 south connects I-255 and I-270 with Cape Girardeau in 103 miles and Memphis, Tennessee in 274 miles. Photo taken by Brian Dowd (06/02). Interstate 255 west ends and Interstate 270 begins ends above the center line of I-55. Leading north from I-255 at Exit 1B, Interstate 55 travels 11.2 miles to combine with I-44 east between the La Salle Park and Soulard neighborhoods in St. Louis. Photos taken by Joel Wade (04/16/05). Interstate 55 travels between the communities of Concord and Mehlville on the 1.5 mile approach to I-255 east and I-270 north (Exit 196). Photo taken 05/03/12. A two lane flyover (Exit 196) departs I-55 north in three quarters of a mile for I-270 north and I-255 east. The west beltway connects I-55 with I-44 at Sunset Hills, I-64 at Town and Country and I-70 at Bridgeton. Photo taken 05/03/12. Exit 196 carries all traffic in unison to Interstate 255 east for Chicago and Indianapolis, Indiana and I-270 north for Columbia and Kansas City. Photo taken 05/03/12. Upgrades made at Exit 196 in 1991-94 replaced a loop ramp from I-55 north to I-270 north with a two-lane flyover. A c/d roadway emerges from the I-55 mainline north next to the nearby Lindbergh Boulevard (U.S. 50-61-67) commercial corridor. Photo taken 05/03/12. Advance signage for Interstate 255 and 270 at Exit 199 on Interstate 55 south. Photo taken by Rich Piehl (12/00). Drivers bound for I-255 east to Columbia, Illinois and I-270 north back to Sunset Hills split. Photo taken by Brian Dowd (06/02). MISO (Missouri Interstate Route Numbering) http://nwindianahwys.homestead.com/MISO.html, Interstate system route numbering web site, Stephen Summers. "I-255 Rim Means Loop is Finished – For Now." St. Louis Post-Dispatch (MO), July 31, 1988. I-244 and I-270 1964-1968 [Facebook update]. Retrieved from https://www.facebook.com/pg/Vintage-St-Louis-513201722060059/photos/?tab=album&album_id=1486995851347303. "Interchange Reconstruction Gets Off To Early Start." St. Louis Post-Dispatch (MO), December 16, 1991.